Green and gray solutions are being evaluated as part of the Long Term Control Plans that municipalities and utilities are developing right now to reduce the amount of sewage dumped into our rivers and streams and backing up onto streets. These plans will have huge impacts on our communities, both positive and negative, from creating jobs and greening cities to traffic disruptions and road closures. That’s why it’s important that you are able to advocate now for the options that bring the greatest benefit to your community. Constructed green spaces designed to capture and detain stormwater before it goes into sewers is known as green infrastructure. Examples include rain gardens, green roofs, enhanced tree pits, or swales. Green solutions can be implemented right now to improve water quality, decrease flooding, reduce the heat island effect, improve air quality, create jobs, and provide needed green spaces. Traditional “gray” infrastructure includes sewer treatment plants and below-the-ground infrastructure like sewer pipes that take raw sewage and water to a sewage plant for treatment. Gray solutions improve water quality and reduce flooding. How are we going to fund these upgrades? Sewer fees: Municipal and regional wastewater utilities operate, maintain, and upgrade CSO systems using funds from sewer fees. Stormwater fees: An equitable fee that is calculated by how much stormwater runs off of a property. Under this approach, larger properties pay more based on the larger amount of hardened surfaces like cement and asphalt, and consequently, greater contribution of stormwater into the system. A bill that authorize municipalities to establish a stormwater utility has passed the state senate and is in the state assembly. Grants: Water Quality Restoration Grants for Non-Point Source Pollution are awarded annually by the Department of Environmental Protection to fund watershed restoration activities, including green infrastructure projects for municipalities with combined sewer systems. 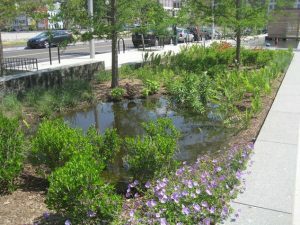 Grants and Low interest loans: The New Jersey Water Bank provides low-interest loans and grants to local government for gray and green infrastructure projects. Here is An Applicant’s Guide to Obtaining Water Bank Funding for Green Infrastructure Projects. Adopting municipal ordinances that require developers to go beyond state minimum requirements to capture more stormwater onsite, improve water quality, and reduce local flood risk. Engaging residents in solutions that reduce combined sewer overflows, like the adopt-a-catch-basin program and free rain barrel programs. Do your part right now to reduce sewage in our rivers and on our streets, by keeping litter out of sewers and streets, reducing water use and conserving rainwater during rainstorms, planting trees, redirecting downspouts to rain barrels or planters, removing concrete from yards, and supporting green infrastructure projects.